An estranged father (Mickey Rooney) goes to an exclusive military academy on Sabre Island to learn more about his son’s mysterious death. This surprisingly entertaining B-thriller possesses one of the least suitable titles I’ve come across in a while. Given that it was produced by schlockmeister Alfred Zugsmith, I rented it expecting to see platinum blondes (a la Mamie Doren and Jan Sterling from Zugsmith’s High School Confidential) prouncing around a traditional American high school campus, getting themselves into all sorts of trouble — but I was pleasantly surprised to find that this film deals with a much more serious plot, and that the “high school” in question is actually a military academy for wealthy (“platinum”) hoods who are two steps away from prison, but whose parents (or guardians, or lawyers) can afford to pay to keep them out. Mickey Rooney turns in an excellent performance in a non-comedic role (proving once again that he was capable of much more than just comedies and musicals), and is surrounded by a very capable cast (including Dan Duryea, Elisha Cook, Jr., Yvette Mimieux, and Terry Moore), all of whom lift the material a notch higher than usual. As entertaining as Platinum High School is, however, I don’t consider it to be “must see” viewing, nor do I necessarily think it’s a “camp classic” as dubbed by Peary in the back of his book. 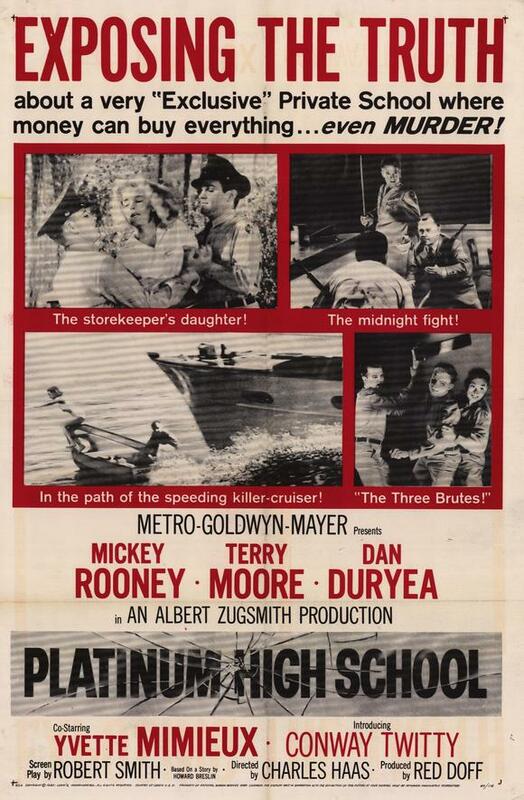 Nonetheless, it remains a slick little thriller, and is certainly required viewing for any fans of Mickey Rooney: you’ll feel genuine concern for his sympathetic character, as he attempts to cut through the dangerous layer of corruption at the Academy, and battles Duryea (playing the nefarious head of the school, Major Kelly) for his life. No, but it’s definitely much better than its title warrants. Not a must – and pretty much in agreement with the assessment here. I’m familiar (in some cases, very familiar) with a number of producer Zugsmith’s films. He did give us some lovely schlock – i.e., ‘Girls Town’ and…sigh…’Female on the Beach’, along with somewhat William Castle-esque schlock – i.e., ‘The Incredible Shrinking Man’, as well as (surprisingly) some real classics like ‘Touch of Evil’, ‘Written on the Wind’ and ‘The Tarnished Angels’. Gee, guess the guy was kinda eclectic. I’m less familiar with the films of director Charles Haas. But, now that I’ve checked out his filmography, any of his feature films may very well be worth hunting down – if only for the casts in each (talk about ‘eclectic’!). Speaking of which, and as noted, the cast here is very capable: Rooney is impressive in his showy yet sympathetic role; with her cool aura, I kept thinking of Moore as having ‘the Annette Bening role’; Berlinger and, eventually, Cook, Jr. register earnestly; Duryea and Jaeckel (yum) are properly menacing; Mimieux is on hand as ‘Helpful, Almost-Mute Blonde Who Is Inexplicably There To Pretty Much Be Ogled And More’ (though not much more; surprisingly, considering there’s just her and Moore in sight for an island full of strapping cadets! ); all this and Conway Twitty, too! I don’t know where Peary got the idea this is camp at all! And, oddly, had it been played as camp (with some different dialogue), it might very well be a must. At any rate, though ffs are not urged to find this one, they’ll be more than reasonably entertained if they do.